Android introduced OpenGL ES 3.0 support from API level 18, Android 4.3 (JELLY_BEAN_MR2). OpenGL ES 3.0 is a super set of OpenGL ES 2.0. We will be creating an Android application which draw a simple rectangle using OpenGL ES 3.0. We will make sure that the application is installed on device which supports OpenGL ES 3.0 using uses-feature tag. And also the minimum SDK and target SDK will set to 18. So far so good. Now lets go to the actual OpenGL ES 3.0 rendering. First line tells that we are going to use GLSL version 3.0. Next we declare our attribute variable. layout(location = 0) specifies the attribute index. See that we are not required to have glBindAttribLocation​ any more. Rest of the statement is same as OpenGL ES 2.0 shader. fragColor is out put variable. The value written to this variable is what will be written out into the color buffer. Here we will have an yellow rectangle. Rest of the source code is almost similar to that of OpenGL ES 2.0 rendering, please note that we will be using android.opengl.GLES30 instead of android.opengl.GLES20. Let me show a method of implementing texture atlas. Texture region is a sub area of the actual texture. It is used for performance benefit, in that texture need not be switched. but the shader implementation internally will convert or transform it to the texture coordinate to match the region's. corresponding to the texture region and multiply it with the texture coordinates. This class creates the 3x3 matrix which transforms the original texture coordinates to texture region coordinates. It is provided with the original texture size and a sub rectangle within the texture. There is no additional logic in vertex shader from that of drawing a simple texture. It is in the fragment shader that we use the texture matrix which transforms the original texture coordinates to the required coordinates. As you are seeing we have declared the uniform variable uTextureMatrix for transforming the texture coordinate. using the matrix uTextureMatrix to the required coordinates. we are using homogeneous coordinate system in two dimension. Complete source code is pasted below for your reference. You need glut to compile it. 18     "    vTexCoord = aTexCoord;\n"
19     "    gl_Position = aPosition;\n"
31     "    vec3 texCoord = uTextureMatrix * vec3(vTexCoord.x, vTexCoord.y, 1.0f);\n"
32     "    gl_FragColor = uColor * texture2D(uTexture, texCoord.xy);\n"
The source code can be compiled using the below command. main.cpp contals the above pasted code. New UI is introduced from Unity 4.6 on wards. New UI controls will be added in the similar way as other components in Unity. Basic step is to create a GameObject and then add the required UI elements and other components to it. If you want to have an hierarchy of UI controls then add child GameObject and continue the process mentioned above. Here we will create a simple dialog as show below just using scripts. We will have a game object added in to our scene and add a script to the object. From this script we will create UI controls. All the UI controls in the NEW UI should be a child of Canvas class. Lets start by creating Canvas class. We will create a GameObject for canvas first and then set the layer to UI and also make it child of current GameObject. Actual Canvas UI class and other required component will be added to this GameObject. Now we will add components RectTransform, Canvas, CanvasScaler and GraphicRaycaster. Next we will create EventSystem so that our controls will responds to events. We will use a Panel to hold our UI controls, so lets create the Panel now. Now lets add the RectTransform component, RectTransform will be stretched which takes 80% of the Canvas size. Now we will add a background image to the panel. We will use a simple png file as the background. png file should be present at Assets\Resources. Now lets go and create Text control. Creating button has two part, first creation of the button itself and the second part is creating a text object for displaying the text. Now lets create the RectTransform and position our button accordingly. Setting background image for button will be similar to that of panel's. The png file button_bkg.png should be at Assets\Resources as before. Creating the actual button, eventListner is of type UnityAction. Next we will have to create a text object with the message and add it to the buttonObject. We can use the same code which creates the text object for this. So I am not a showing that here. Ok now we have created NEW UI using just scripts. Complete source code is pasted below. Please note that the code is no where near release quality. Another, may be better, option is to use prefab. Create the UI using the unity editor and create prefab. 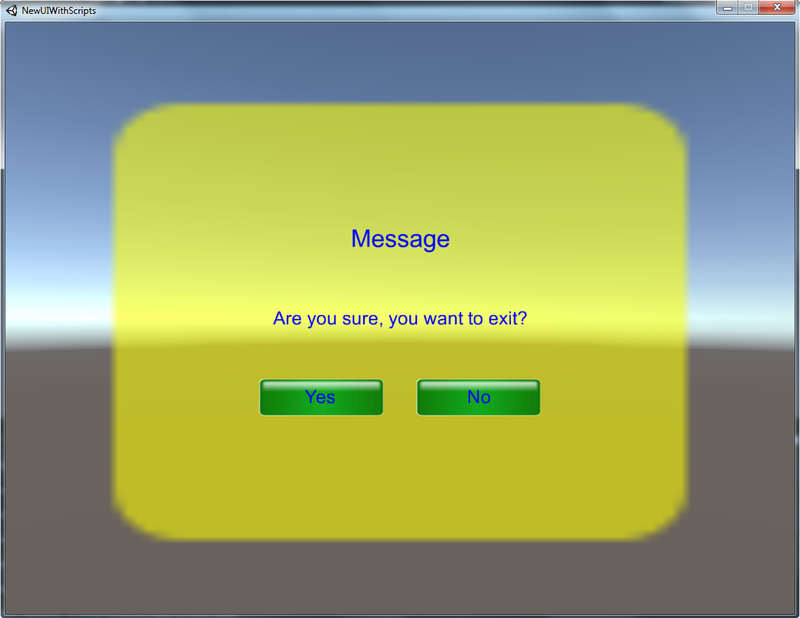 Using prefab we can launch the UI as shown below, Here DialogCanvas is the prefab and Yes and No are name of the GameObjects which has Button component.